Russell Westbrook's second performance signature sneaker, the Jordan Why Not Zer0.2, is slowly but surely being rolled out in new colorways, including an all new "Game Boy" rendition. 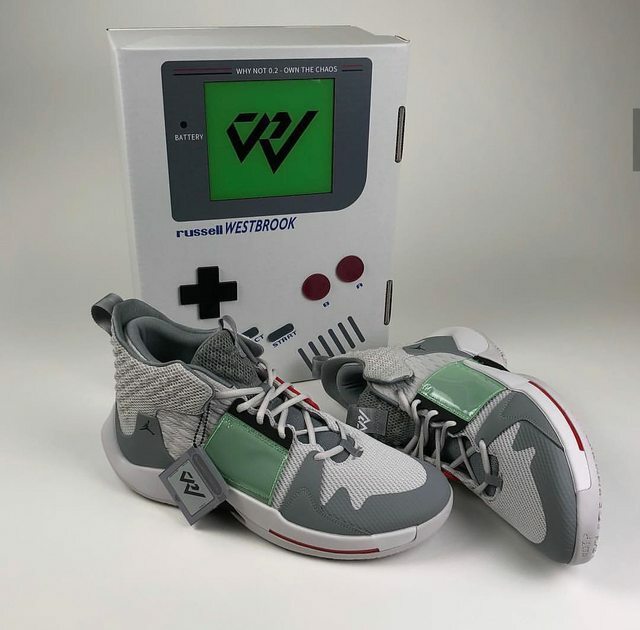 The video game-themed kicks first surfaced via Reconbeatlab, along with a Game Boy inspired sneaker box featuring Westbrook's logo and his name spelled out in the Game Boy font. It remains to be seen if this is a PE for Russ or a new pair that is actually headed to retail later this year. That said, Westbrook has already taken the court in a "Super Soaker" colorway, so it makes sense that there are other 90s-inspired Why Not Zer0.2's in the works. Similar to the newly unveiled "Game Boy" Why Not Zer0.2, the "Super Soaker" rendition was also housed in an exclusive box resembling the way the classic '90s water guns were packaged. Click here for more details on that PE and stay tuned for more information on the Game Boy joint.